December 14, 2016 Jamie L.
1. Glossier is my new beauty find & obsession. I have several favorites but this balm dotcom lip balm can be enjoyed by almost anyone. If you want lip balms with something a little extra, try one of their flavored balm dotcom series! 2. When you or someone you know is in need of some serious girl power inspiration, turn the pages of this book filled with adorable illustrations by Rachel Ignotofsky. Contained within are achievements of 50 remarkable women in the fields of sciences, technology, engineering, and mathematics (STEM). 3. Caffeine molecule necklace in rose gold. Enough said. 4. Once in awhile I come across a book that I just can't put down until I've read it cover to cover. This book is special because I felt like Dr. Kalanithi was able to beautifully verbalize all the deep-in-my-soul reasons why I wanted to go into medicine. Highly recommended for everyone, not just those in the medical field! 5. Another one of my new obsessions is phone cases with exchangeable back plates from Casetify. New phone cases instantly make you feel like you have a new phone, which is great if you can't upgrade your phone for awhile! "Alexa, play some holiday music"
"Alexa, what's the weather like outside?" "Alexa, set an alarm for 7am tomorrow"
7. Nothing makes stapling as fun and glamorous as this acrylic stapler with gold accents. Brighten your/someone else's desk with this fun item! 8. An inspirational mug + some nice, hot tea = an instant mood lifter. 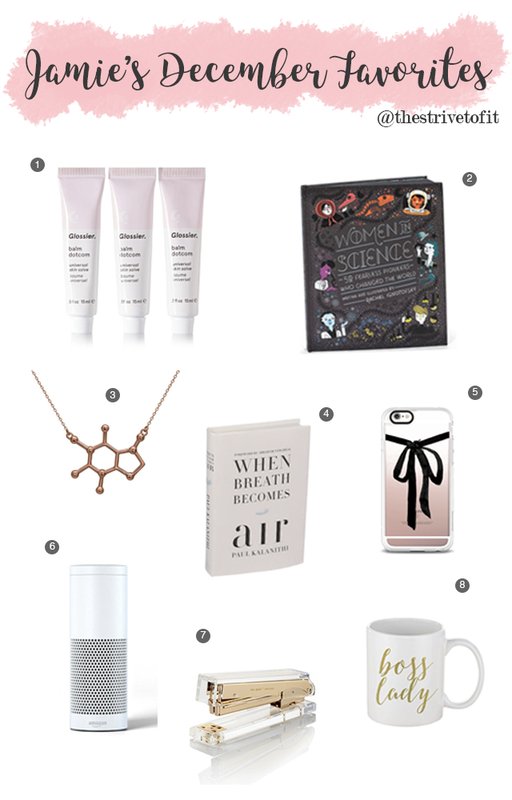 Show your intellectual girl crush/lab partner/homework buddy how boss you think they are! P.S. This was my first time attempting to use PhotoShop, so bear with me on the poor graphics. I promise I will work on my skills to make better visuals!